This is the first skit of the five skits aired that night. It evokes many head-tilting "huh?" with laughs which Matsumoto does best in his comedy. A day after MHK aired, a documentary, which chronicles the making of MHK, premiered. 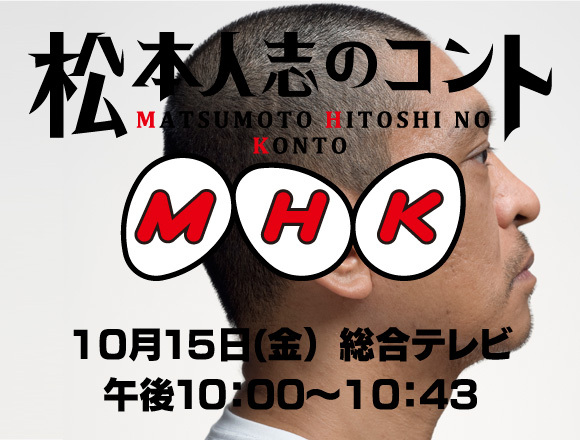 The documentary shows the time, energy, and dedication Matsumoto put forth for his skits in a midst of all the other obligations he has. Can't say that I found it all that funny.....although when it started running and the whistle started blowing I couldn't stop laughing for some reason. Awesome. I always wanted to see this entire skit ever since I watched snippets of it in 'Matsumoto Hitoshi no Honto.' As for the skit itself, I liked it. It reminded me of the kind of world that Jinnai Tomonori uses in his skits where he is sane but everyone else is just crazy. I love that type of humor and I love Matsumoto so thank you for sharing! Before seeing this video , I remember seeing the documentary for the planning of this skit. It was cool seeing the process and the ideas they had for other skits. Now that I finally see the skit, It has it's moments but very few. When I saw the documentary I was excited to see that Matsumoto-san was doing short skits again. I was a big fan of gottsu ee kanji. But out of all the ideas on the board, this was the one that we got a glimpse of. Now that I finally see it, this is the first time I did not like a skit from Matsumoto. I was very disappointed in this one. I guess it happens. I'm so confused, yet so entertained. I watched the entire documentary behind the making of this skit, it delves into Matsumoto's much more personal insight on comedy in general. He's much more serious, strict and distant in real life, I was quite shocked, Hamada being more laid back in real life than him. Considering the funniest part of Gaki no Tsukai to me are the unscripted bits, the witty banter between the five members of the cast, I'd figure he must be a real joker in real life. I'm also quite shocked how Matsumoto's view on comedy is just so peculiar. what he and his team perceived as funny, just seems so vague and unfunny to me. The documentary stressed again and again even the Japanese public are confused with his views on comedy and he's misunderstood most of the time? Is this true? I can see some funny parts in here, but it certainly isn't the "ROFL" kind of funny. But it's fine as I did enjoy the skit overall, and appreciate you subbing the video as usual. The first funny part was how Matsumoto just kept repeating himself in the beginning of how he didn't expect it to come until tomorrow. 2nd part would have to be how the instructional video is thought to be quite instructional/helpful when it turns out to be quite useless as anyone could have figured out how to assemble the thing from just looking at it. Like honestly...if the antenna-majiga-thing really had to be put in the 3rd hole...why have all the other holes there?! HAHAHA. And then there's the part with the "extension tube sold separately" - classic. Another part being the warning of how the "jaw" may hurt. And lastly we see Matsumoto calling about how his jaw hurts. Either he is in awe of how "awesome" the product is or in shock by realizing how ridiculous it is. I think what people are missing here is the HUGE amount of buildup for the incredibly random payoff. This is a fine skit that deals with constant absurdities in a matter of fact way. LOVED that he had $1500 under his pillow. For the SHIPPING. Some of y'all need to get your minds right. Matsumoto is a god. Dailymotion is really bad. Can you upload elsewhere? Can you try a new Youtube channel? Was interesting and cute, but I kept thinking of lots of crazy jokes he could have done along the way. Like I was expecting the end for him to give a blank expression of the machines odd activity, then burst out with excitement and joy, hehe. I love all of your feedback. Maybe I have a weird sense of humor but I was laughing the entire time, I thought it was hilarious. Matsumoto's comedy always has me switching back and forth between staring in fascination, and laughing uncontrollably. I get wrapped up in parts, and then the ridiculousness of the situation hits me all at once. I had no idea what to expect when he actually turned the thing on, and I wound up laughing so hard. Now I can't even look at my vacuum cleaner without saying "Please make sure the elephantic tube is aimed outside of your house." When he fires up the thing, and it started cracking on it's own, i jsut pissed in laugh at ho ridiculous this skit is. But the little robot puking green jelly just killed me. I'm crying. Thansk a lot Shibatabread ! I decided to come and look for more videos to watch and I watched this one a week ago. And then I remember suddenly "Well my jaw is starting to hurt"